I've always had a soft spot for patriotic decor. There is something about decorating your front porch with flags, buntings and banners, that just makes a girl (or guy) proud to be an American. We have a very down-home, main street style parade that passes by our house each Memorial Day. I put up our flags, buntings and banners for that, and then I leave them up until after the 4th of July. In recent years, food has gotten into the patriotic game. It's gotten much larger than the tried and true strawberries and blueberries on a pound cake. Although that remains a personal favorite. There are cupcakes, frozen treats, cookies and I even made a Red, White and Blue Potato Salad one year! Sometimes it just takes a spark of an idea or some inspiration to hit upon the perfect combo. 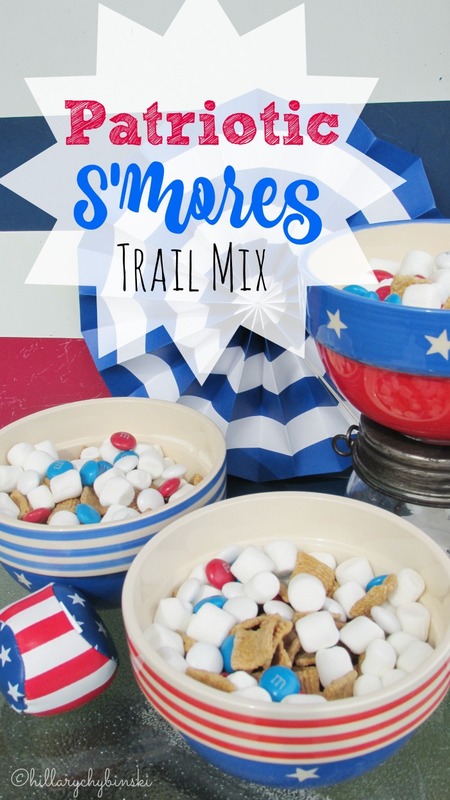 Combining a classic summer treat like s'mores with a patriotic flair, makes for the perfect treat from Memorial Day to Flag Day to the Fourth of July. Nothing beats a true s'more, made with a classic Hershey Chocolate bar and a marshmallow toasted over an open flame in the great outdoors. But they aren't always practical. 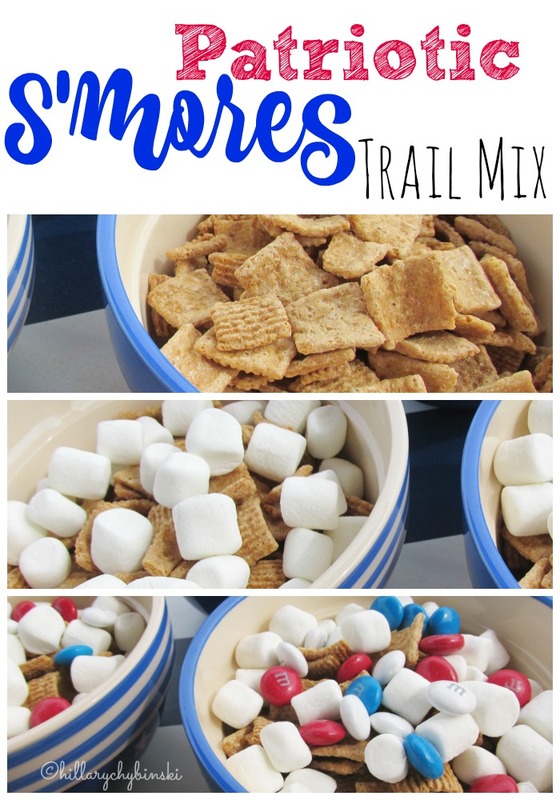 Enter a quick and no-mess trail mix solution that still provides the flavor sensation of gram cracker, chocolate and marshmallow. All you need is a box of Golden Graham cereal, a bag of mini marshmallows and a bag of red, white and blue M and Ms. Simply grab a large bowl and dump about four handfuls of the cereal into it. Add in 1-2 handfuls of mini marshmallows (depending on personal preference) and 1-2 handfuls of M and Ms (or the whole bag, if you're me!) Give it a good mix. You can either leave it in the bowl to serve, or transfer it into individual or smaller size containers for serving or transporting. Need some fun serving ideas? Going to a cookout or picnic? Package up some of the trail mix in mason jars for easy travel. It also makes a great hostess gift, tied with a ribbon or some twine. 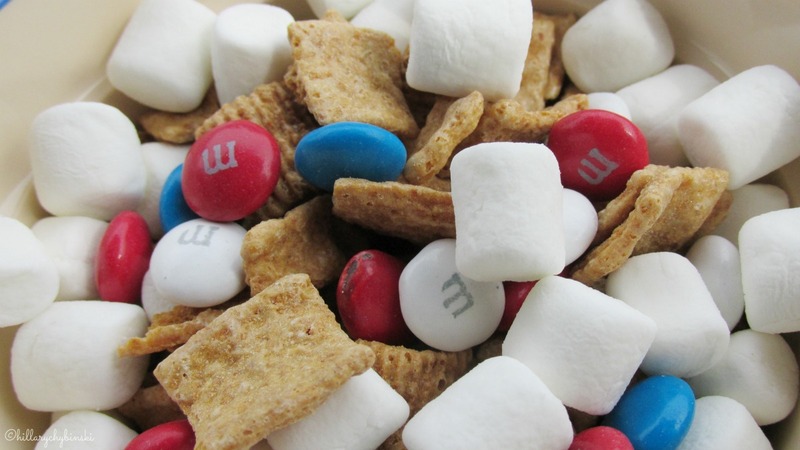 And there you have it, an easy and no-mess patriotic treat with the classic taste of s'mores. What's your favorite patriotic snack?